Western Express - California - San Francisco Based - Wells Fargo & Co.
Wells, Fargo & Co., California Express., orange buff cover with red two-line handstamp and matching bold "FREE" rating handstamp to Sacramento Cal., pencil "Recd Jul 13 1852" by Latham; professionally restored at right, Very Fine appearance. 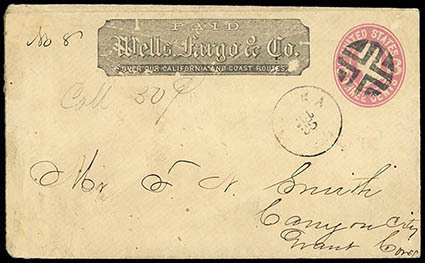 THIS IS THE ONLY RECORDED WELLS FARGO & CO. FIRST DAY COVER. 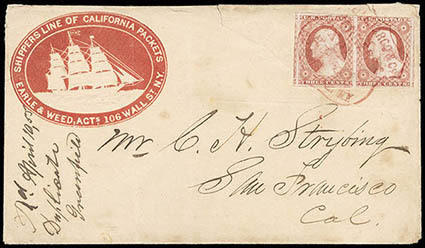 THE ONLY RECORDED COVER WITH THE CALIFORNIA EXPRESS HANDSTAMP. Rueben H. Washburn carried this cover on his initial journey to San Francisco where he established a branch on July 13, 1852. 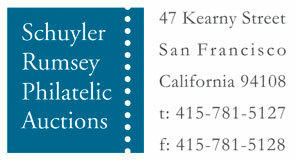 On that day, this cover was carried "Free" to William Latham Jr., Sacramento agent for Adams Express. Wells, Fargo & Co. would become the largest express carrier in the world. It operated from 1852 until 1895, when they determined that it would no longer be economical to carry the mails. 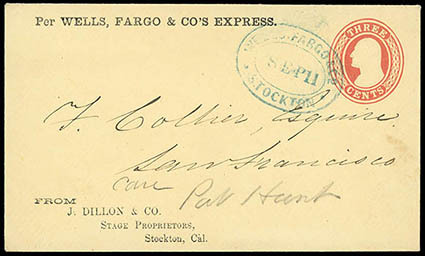 Per Wells, Fargo & Co's Express., printed endorsement and "J. Dillon & Co., Stage Proprietors, Stockton, Cal." 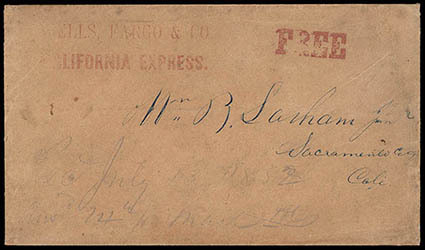 return address on 3¢ red (U10) buff entire cancelled by blue "Wells, Fargo & Co., Stockton, Sep 11" double-oval datestamp to San Francisco Cal., Cal. ; bit of flap missing, fresh and Very Fine, an unusual printed Wells Fargo endorsement envelope. 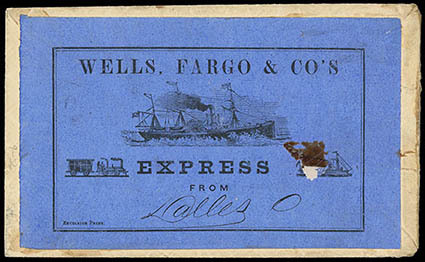 Wells, Fargo & Co., printed frank on 3¢ pink (U59) buff entire cancelled by fancy cross-roads duplexed with partial "Yreka Cal., Jul 25" cds to Canyon City Cal., Wells Fargo pencil "Coll 50¢", reverse with large "Wells, Fargo & Co's Express 'Dalles O' " black on blue label; tape stain and scuff, F.-V.F. 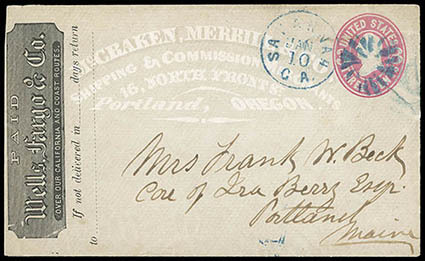 Wells, Fargo & Co., printed frank on all-over gray shaded McCracken, Merril & Co., Shipping & Commission Merchants, Portland Oregon on 3¢ pink (U58) entire cancelled by blue "Savannah Ga., Jan 10" duplex to Portland Maine, Fine and unusual eastern use of entire. Wells, Fargo & Co., red printed frank on 10¢ green (U18) buff Nesbitt entire to Havana, Cuba, carried by express to New York City where black strike of square grid cancel and "New-York Mar. 16" cds were applied, additional red "New-York Mar. 17, 1857" cds, blue "Habana, 24 Mar 1857" backstamp and matching "NA" and "2" reales due markings; small central stain and some edge wear, Very Fine, ex-Barkhausen (backstamp), Kouri. Thomas No. WFE-22 Estimate $1,000 - 1,500. THIS IS THE ONLY REPORTED USE OF THE WELLS, FARGO & CO. FRANKED ENTIRE TO CUBA. Wells, Fargo & Co., red printed paid frank on 10¢ green (U18) buff entire to Pesth, Austria, endorsed "via Panama & Liverpool" at bottom left, bearing twenty-two copies of 1¢ blue (24) in two blocks of eight and six overlapping singles on reverse and slightly over edge, each cancelled by matching red N.Y. foreign mail circular grid cancel, matching strike on indicia, red "N. York 'Paid 7' Br. Pkt." credit exchange cds, carried by Cunard Line Asia from New York Feb. 16th 1859 to Liverpool arriving Feb. 27th, red "Aachen Franco 4. 1" framed handstamp, Pesth (3.3) arrival cds; open on three sides for display, small stamp faults, Very Fine, ex-Dale-Lichtenstein. 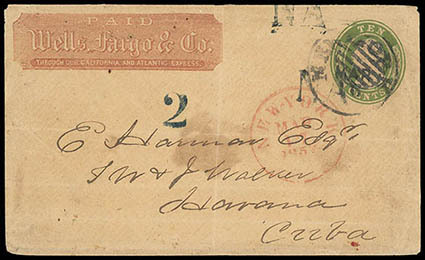 A REMARKABLE WELLS FARGO EXPRESS COVER TO AUSTRIA VIA PRUSSIAN CLOSED MAIL WITH A STUNNING 1¢ 1857 ISSUE FRANKING. 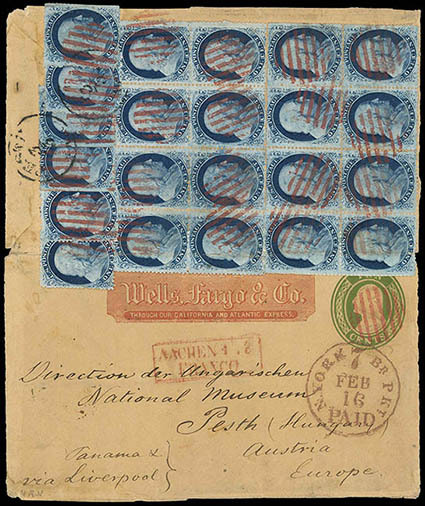 The 32¢ postage overpays the 30¢ Prussian Closed Mail rate to Austria effective October 1852 to August 30th 1861. Wells, Fargo & Co., Bankers & Express Forwarders, 82 Broadway NY, red shield handstamp ties 3¢ dull red (11A) horizontal pair, huge margins except touched at top right, on 1855 light buff cover to San Francisco Cal. with red Shippers Line of California Packets, Earle & Weed, Agts. illustrated cameo showing full rigged ship bearing; small edge tears and some wear, Very Fine and attractive, ex-Haas. ONE OF ONLY TWO RECORDED RED WELLS FARGO NEW YORK SHIELD MARKINGS. 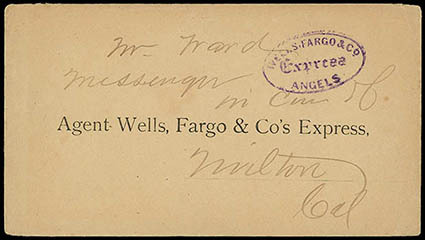 Wells, Fargo & Co. Express, Angels, clear strike of purple oval handstamp on buff cover addressed to "Mr Ward, Messenger in care" with printed "Agent Wells, Fargo & Co's Express" at Wilton Cal., Very Fine, This is the only recorded example of this Wells Fargo Angels oval handstamp in purple., ex-Clifford. 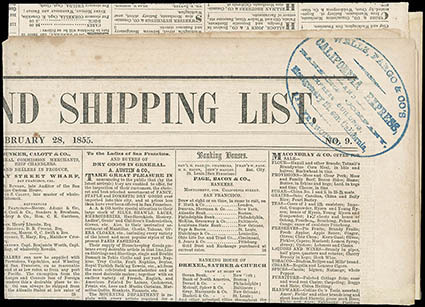 Wells, Fargo & Co's California Express, San Francisco, large blue oval handstamp on February 28th 1858 San Francisco Prices Current and Shipping News, one page with part of ad excised, Very Fine strike of this handstamp. 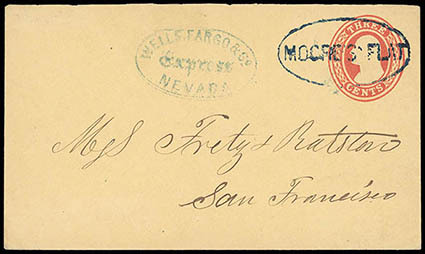 Wells, Fargo & Co. Express, Nevada, blue oval handstamp and dark blue "Moore's Flat" oval handstamp on 3¢ red (U10) buff Nesbitt entire to San Francisco Cal., Very Fine and choice, ex-Marcus White.